Patrick J: I asked my good friend George N to write a guest post on “what it means to be an Asian NBA fan and to have Jeremy Lin intervene into his NBA fandom.” He graciously replied with his thoughts below. So what’s so special about Lin? For me, part of the reason why I wanted to see him play was the connection with Asian friends. Were they watching him because he’s Asian? I can’t be sure, but I’m assuming that’s part of it. But if he wasn’t entertaining, I’d stop (and I’d still watch CP3 over Lin eight days a week.) I watch a lot of sports anyways–I even watched Tebow (I’m not remotely religious, and I cringe when Tebow and now Lin make their repeated religious shoutouts). Will I root for Lin when he plays against the Warriors? I’ll root for him to not get hurt, but I hope Steph drops 40 on him in a Dubs blowout. I gave into the hype and watched the Utah game. What I discovered is, Lin is “smart.” This is an overused cliche by now because it’s a shortcut for describing an Asian who graduated from Harvard. But he’d be a smart point guard if he were black, white, red, or yellow. What I saw was a point guard who could legitimately run the pick-and-roll and keep the dribble alive, as well as use that little hesitation dribble move that he’s got. He kept his head up and constantly looked for teammates, and he was constantly putting pressure on defenses through his ability to finish at the cup, often while absorbing contact. He also showed he could make a one-handed bounce pass off the dribble. Is that special? I don’t know whether it should be among NBA point guards, but it is. Ricky Rubio does it. Steve Nash does it. Jason Kidd does it. A few others do too. But not everyone. After watching a point guard with the athletic gifts of John Wall play all year and NOT be able to do it–he always picks up his dribble, seemingly for no good reason (although half the time, it could be because McGee isn’t even looking for a pass)–Lin impressed me with his point guard acumen. He can control the tempo and create for others and do things that John Wall and many other starting PGs in the league routinely fail to do. The next Knicks game was in Washington. I attended. And there was certainly a buzz around the game. There were lots of Asian fans in attendance, and I was a little uncomfortable with being clumped in with the bandwagon Asian/Lin fans since I’m a Wiz season-ticket holder and attend almost all home games. I’m not emotionally invested in the Wiz like I am the Dubs, but what I want from them is to play well enough so that the other team has to play hard to win. Most of all, I want Wall to develop so that I won’t have to sit through another season at Verizon watching an NBA bottom-feeder each night. They seemed surprise to see an Asian dunk. How many guys in the NBA can make that play? Westbrook, Wade, Rose, LeBron, and Ellis are the ones who come, at least in terms of having the speed and handles to go coast-to-coast and finish. But judging by the number of views on Youtube, the general population is more interested in the Lin dunk. How good can Lin be? I’ve been blessed this year to see a lot of great players play live. Williams. Paul. Rose. Westbrook. Rondo. What you notice is that even when top players have an off-night, you still feel their impact on the game. Lin isn’t in that category and probably never will be. He’s a nice upper-tier point guard, but he turns the ball over too much and doesn’t have that extra gear like Westbrook or Rose or that second set of eyes like Nash. His statistical accolades, such as the most points in his first 4 starts, etc) are real and provide some validation that he can play, but he’s definitely overhyped at this point (and will probably be an All-Star for the next 10 years from the Chinese vote alone). That said, Lin is still a young, developing point guard, and the Knicks suddenly look dangerous even despite the beating they took last night in Miami. 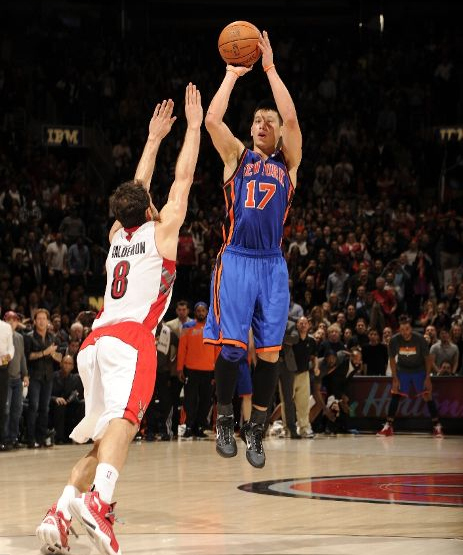 I’d like to see some credit go to Steve Novak, who has been underrated during Lin’s run and deserves much more credit than he’s received. He’s averaging a 3pt field goal every 7 minutes he’s played during this run while doing his best Ryan Anderson impression–not a bad act to follow. Even from simple pickup games, I realize that race can shape that initial impression in sports (Not bitter, I would have picked that athletic looking guy first too) – but after a couple runs when people have some “samples” of ability, your evaluation is based more on the actual play (so then I can get picked last for missing a bunch of layups rather than being Asian). At the NBA level (besides the elite few), that talent difference is often razor thin. So that opportunity and confidence (from your coach) matters significantly. I’m definitely glad that he got the opportunity and that he has taken advantage of it. I’m skeptical of additional opportunities for Asians arising because this, nor do I think that they should just because of this (These things are a zero sum game, one guy gets an opportunity – one doesn’t/gets cut). The NBA is extremely competitive regardless of race. When people say things like he’s an inspiration to those in the Asian community trying to chase their dreams, I think it’s a bit much… If you’re really tall, coordinated, and athletic – sure, chase a NBA dream… but have a good backup plan handy. I’m generally not seeing the (positive causal effect) connection between him playing and anyone else’s non-basketball career path. Could it have a positive effect on your chances of being recruited if you’re a strong high school Asian basketball prospect? potentially? Either way, Lin (probably against his own wishes) gives several groups a flag bearer – so I’m happy for those fans. Ah f*ck it, maybe I will just root for Lin after all. As an Asian American I can relate with this post. Although as a writer I’m more concerned with the incessant use of the name “Lin” as a prefix. Seriously I wish it would stop already.